This Product Information Guide was designed to provide an informational overview of our products. It can be used in conjunction with the X-otic Colours® Product Application Directions Booklet, the X-otic Colours® Custom Design and Styling Book, the X-otic Colours® Formula Book, and our product price lists. X-otic Colours® breakthrough in the custom paint industry was the development of a new tinting system for custom paint that allowed for an infinite variety of colour to be created, formulated, and produced. Another breakthrough followed – the invention of a unique Custom Design and Styling Book. The book contains Candee coloured transparencies that are placed over a light, medium, or dark shade of a wide selection of illustrated basecoat colours. The Custom Design and Styling Book predicts colour outcomes prior to mixing. Endless colour combinations can now be viewed and then created. The X-otic Colours® Custom Paint System also solves problems. Custom painters frequently found the color they chose was not immediately available. In some cases, even a warehouse distributor did not have the required color. The painter could be required to wait until additional paint was manufactured. This was unsatisfactory. This problem occurred because jobbers or warehouse distributors needed to have extensive and costly inventories for the myriad of available colors, some of which were rarely sold. With the X-otic Colours® Custom Paint System, all colour series are produced on demand from just six Untinted Neutral Bases. Our system solves problems for the customer, the jobber, and the warehouse distributor. The development and design of the X-otic Colours® Custom Paint System is centered on six Untinted Neutral Bases. Only six Untinted Neutral Base products are transformed by the addition of tint pastes, toners, and pearls into eight complete lines of Basecoats, a complete line of Candee Mid-Coats, and a complete line of Jammin’ Coats! The six neutral base products are mutually compatible with all of our toners, tint pastes, and pearls. This compatibility leads to unlimited colour possibilities within the X-otic Colours® Custom Paint System. As an alternative to creating new colour, we illustrate over 300 brilliant colours. Easy to understand formulas are provided for these 300 colours. The X-otic Colours® product line includes our Epoxee Primers, six Untinted Neutral Bases, Reducers, and our Production and Sun-Bloct Final Cleer. Tinting is accomplished with our line of toners, tint pastes, and dry pearls. The X-otic Colours® Custom Paint System is centered on our six Untinted Neutral Base products. See Table of Contents – Section A. The addition of toners, tint pastes, and dry pearls completes the tinting transformation of X-otic Colours® six Untinted Neutral Base products into our eight product lines of Basecoats, our product line of Candee Mid-Coats, and our product line of Jammin’ Coats. See Table of Contents – Section B. Simple tinting directions are provided in our formula book. When these same Untinted Neutral Bases are used in conjunction with X-otic Colours unique Custom Design and Styling Book, an infinite variety of colour can be produced. X-otic Colours® does not use a typical factory color card. Custom painters, working with X-otic Colours® unique Custom Design and Styling Book, can create an infinite spectrum of colour. These craftsmen are no longer limited to stock factory colors. Mutual compatibility of our six neutral base products with our toners, tint pastes, and dry pearls create an endless array of new colour options. Incredible colour selections with new creative opportunities are now available. The limited inventory required to make this infinite variety of custom paint products is a tremendous asset to the distribution system. Our Untinted Neutral Base products are manufactured to the highest standards under strict quality control. The neutral base products of X-otic Colours® are noted for their acceptance and compatibility with our toners, tint pastes, and pearls. X-otic Colours® Neutral Base Products have been formulated to produce excellent merging between coats along with superior coverage. Our Basecoats, along with all other coatings in the X-otic Colours® Custom Painting System, are U.V. protected. Other manufacturers are not providing this level of protection. All products in the X-otic Colours® Custom Paint System including our Untinted Neutral Base products use a five-digit number. There are many colours in each Basecoat, Candee Mid-Coat, or Jammin’ Coat product line or colour series. Therefore, we have only provided the product pre-fix number. The product pre-fix number is the first two digits and will identify a complete product line or colour series. Any five-digit colour number also uses the same five digit formula number within our formula book. 07-Colour Series: For X-otic Colours® Additional Product Literature — See Index: Additional Product Literature, at the end of this Product Information Guide. This product is used for the production of X-otic Colours® extensive product line or colour series of Sparklin’ Metallic Basecoats. When our toners or tint pastes are added to our Metallic Untinted Neutral Base (product number 08-200) our extensive product line or colour series of Sparklin’ Metallic Basecoats is produced. See description below. This product is used for the production of X-otic Colours® four product lines or colour series of Pearl Basecoats. X-otic Colours has a spectacular selection of iridescent dry pearl products. Four complete Pearl Basecoat product lines or colour series are produced when our three different types of dry pearls are added to our Pearl Untinted Neutral Base. See descriptions below. X-otic Colours® extensive product lines of Pearl Basecoats are known for their quality and iridescence. The X-otic Colours Custom Paint System is designed for experimentation. Custom painters will want to experiment with our dry pearls in both our Pearl Untinted Neutral Base and any of our other neutral base products to produce new and unique variations. See also: Dry Pearls in this product information guide. Pearlin’ Basecoats – 76: product line or colour series commence with the product pre-fix number 76. X-otic Colours® has selected dry pearls whose particle size is carefully controlled. 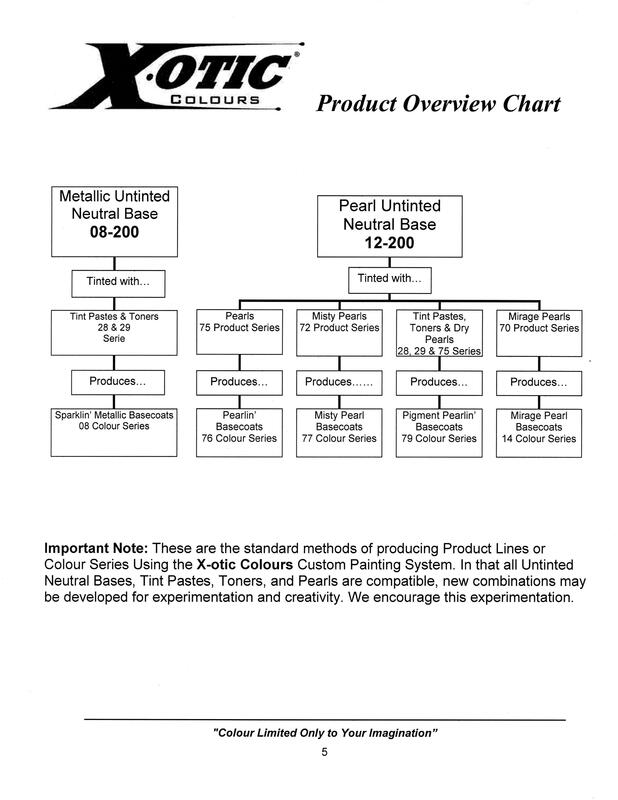 This is essential in producing uniform effects in each pearl colour within this series. Pearlin’ Basecoats offer unparalleled quality and iridescent effect. This product is used for the production of X-otic Colours® Solid Colour Basecoats. When our extensive line of toners and tint pastes are added to our Solid Colour Untinted Neutral Base product number 34-100 the product line or colour series of Solid Colour Basecoats is produced. This product is used for the production of X-otic Colours® product line or colour series of Candee Mid-Coats. The simple addition of toners and tint pastes to this Candee Mid-Coat Untinted Neutral Base creates an entire line of Candee Mid-Coats. Candee Mid-Coats – 24: product line or colour series commence with the product pre-fix number 24. Candee Mid-Coats add visual appeal to the finished product by adding both depth and gloss. Candee Mid-Coats can be applied over X-otic Colours® product line of Sparklin’ Metallic Basecoats or our product line of Pearl Basecoats. Candee Mid-Coats are most frequently applied over our concentrated Sparklee Silver Metallic Basecoat product number 08-100 which is a factory pak product. The X-otic Colours® Custom Design and Styling Book comes with 44 Candee colour overlay transparencies. By placing these Candee colour transparencies over a light, medium or dark shade of illustrated metallic and pearl basecoats, an endless array of colours can be viewed and then formulated. No other system allows the custom painter to work with such precision and variety to create truly unique custom colours. This is our only Factory Pak Basecoat. This product is typically selected when a Candee Mid-Coat is going to be applied directly over a Silver Metallic Basecoat. Any Epoxee Primer (Part A), requires the corresponding Epoxee Primer Catalyst (Part B). [C] Requires Urethane Catalyst, product 40-100. This is a multi-function product, also used as our Candee Mid-Coat Untinted Neutral Base with the same product number. This is a multi-function product, also used as our Jammin’ Untinted Neutral Base with the same product number. Note: Concentrated Silver Metallic Basecoat: is used when an, Untinted Silver Metallic Basecoat is chosen. This basecoat should be selected when the basecoat will be silver metallic. The product is concentrated with more aluminum and is typically not used as a metallic base that will be tinted or receive colour. Sparklee Silver Metallic Basecoat is most often used when a Candee Mid-Coat will be applied directly over a Silver Metallic Basecoat. This is the only factory pak Basecoat in the X-otic Colours® Custom Paint System. The heart of the X-otic Colours® Custom Paint System is our selection of high quality brilliant pigments contained in our toners and tint pastes. These pigments have been selected for their ability to resist fading. Resistance to fading adds to the longevity of our finishes. Through our state of the art manufacturing process, we transform these pigments into X-otic Colours® toners and tint pastes. These toners and tint pastes are then added to our neutral base products at the point of sale to create many of our product lines or colour series of basecoats, our product line of Candee Mid-Coats, and product line of Jammin’ coats. X-otic Colours®, from worldwide sources, has been able to locate the finest raw materials and pigments to produce these products. X-otic Colours® expertise in product formulation and quality control produces better products. These products are produced in our own facilities. This insures consistent product quality that will meet our exacting standards. X-otic Colours three types of dry pearl products are typically added to our Pearl Untinted Neutral Base product number 12-200 or our Imagin’ Untinted Neutral Base, product number 20-101. The X-otic Colours® three dry pearl products are noted for their clarity and iridescence. From sources around the world, the finest pearls are obtained. These products are screened using colorimetric quality control with tests carried out at various geometries. The luster and iridescent effect is actually achieved by light interference and not from absorption or reflection of visible light. The products in this series commence with the product pre-fix number 75. X-otic Colours® product series of dry Pearls contains numerous different coloured pearls. They are sold in 4 oz. containers. Particle size influences the pearl luster affect and adds another dimension of beauty and quality. The products in this series commence with the product pre-fix number 72. The Misty Pearl series has a wide selection of different coloured dry pearls. Misty Pearls are sold in 2 oz. containers. Misty Pearls contain larger size particles that are primarily composed of platelets of flat mica coated with titanium dioxide and/or iron oxide. Misty Pearls give a pearl/metallic effect. The products in this series commence with the product pre-fix number 70. There are currently 10 different Mirage Pearls. Mirage Pearls are sold in 10-gram lots. They can be resold by the gram. Mirage Pearls give the dramatic effect of colour shifts when viewed under different angles of light refraction. The products in this series commence with the product pre-fix numbers 80-83. There are currently 32 different colours in the 80 series. There are 2 different colors and 9 different sizes of the 83 series. They are sold in 4-oz. jars and 2-oz. jars depending on color. They can be resold by the ounce or gram. In some situations, custom painters may desire to purchase these dry pearls separately. The user price list provides for this option. The X-otic Colours® Custom Paint System provides flexibility by allowing these products to be used in our other neutral base products. For example, a custom painter may wish to use a dry pearl in our Metallic Untinted Neutral Base. The primers provided by X-otic Colours® are an essential part of the X-otic Colours® Custom Paint System. X-otic Colours® Epoxee Primers are manufactured for custom painters who want the highest levels of quality in their finished production. The colour selection of your primer will usually depend on the predominant colour of your basecoat. The following are suggestions. These suggestions are not a rule because of the unlimited variables in Basecoat colour selection. If you have selected one of our Mirage Pearl Basecoats product pre-fix number 14-, or one of our Mirage Imagin’ Basecoats product pre-fix number 20-, Pearl Imagin’ Basecoat product pre-fix number 21 or a very dark or black basecoat, the customer must use our black Epoxee primer product number 01-200. Tintable Epoxee Primer product number 01-300 may be used for faster basecoat coverage and to more closely resemble the Basecoat colour. In the event of a rock chip or scratch, the damage will be less obvious using our Tintable Primer. X-otic Colours® Inc. produces the highest quality Epoxee primers. These high quality products are the foundation of the X-otic Colours Custom Paint System. Additional steps in our manufacturing process contribute to the production of a superior product. X-otic Colours 2-part Epoxee primers exceed the highest industry standards. These products are known for their outstanding performance. X-otic Colours Epoxee Primers provide excellent adhesion on a variety of substrates including steel, aluminum, fiberglass, some plastics, and other metals. X-otic Colours Epoxee Primers are a high solids/high build material. Our formulation maintains uniform suspension of these high concentrations of solids, thus, preventing settling and application problems. X-otic Colours high solids evenly ground primers have superb filling capabilities. These Epoxee Primers can easily be wet or dry sanded. Sand scratches will not swell when top-coated. These primers prevent bleeding. The product is heat resistant to 400°F. Repeated heating and cooling will not affect adhesion. Once cured, our primers will maintain flexibility and will not shrink. X-otic Colours Epoxee Primers resist cracks and lifting. X-otic Colours high solids Epoxee Primers provide excellent corrosion resistance. They have excellent “holdout” and do not require the application of sealers. This will save the customer time. Our reducers are blended to provide outstanding performance when used in conjunction within the X-otic Colours Custom Paint System. X-otic Colours Reducers are produced from premium virgin solvents. X-otic Colours Reducers are an integral part of our custom paint system. These products are designed to produce maximum flow with exceptional gloss in our catalyzed products. 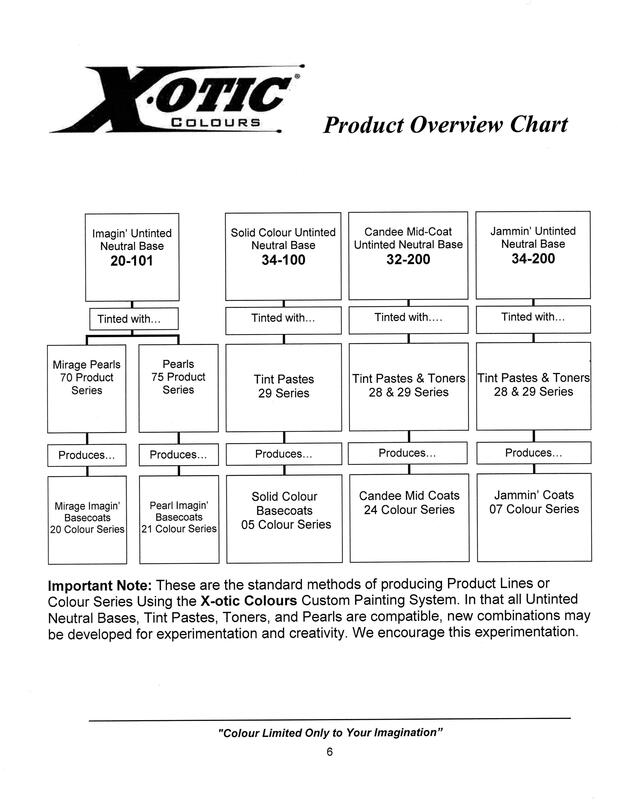 All X-otic Colours Basecoats, Candee Mid Coast, and Jammin Coats require reducer with two important exceptions: Pearl Imagin’ Basecoats (colour series prefix number 21), and Mirage Imagin’ Basecoats, (colour series prefix number 20) are not reduced. This product is used to complete the perfect custom project. Our Sun-Bloct Final Cleer is formulated with premium acrylic urethane resins. Sun-Bloct Final Cleer is easy to wet sand and buff. When used with our Reducers, this product is “user friendly” with excellent flow and leveling characteristics. Our Sun-Bloct Final Cleer will produce a high-gloss finish that is resilient and chip resistant. The finish provides incredible tensile strength and will also be resistant to damage or intrusion from chemical sources. Curing will require 16 to 24 hours at 70ºF. This product is a faster drying urethane cleer. It is used to promote distinction of image, D.O.I., and for rapid film building. If Production Cleer is used as a final cleer, the finish will require more time to buff and shine. This product has the advantage of speed. Production Cleer will cure faster than our Sun-Bloct Final Cleer. Production Cleer requires eight hours of curing at a temperature of 70ºF before wet sanding. Production Cleer may also be force cured at 140°F for 45 to 60 minutes. This is a multifunction product that is also used as an Untinted Neutral Base for our Candee Mid-Coats. This product is required for both the Sun Bloct-Final Cleer and Production Cleer. This product is used to protect basecoats from tape marks when artwork or graphics are to be applied. This product is also used as a bonding coat that promotes adhesion. When any coat in a series of applications will not be completed within its recoat window, typically one hour or less, specific steps must be taken before the recoat window has passed. The Product Application Directions Booklet informs the customer how to use our Protective/Bonding/ & Jammin’ Cleer in these situations. This product can be tinted for use as a Jammin’ Cleer or Jammin’ Coat to match Candee Mid-Coats for use within trunks and under hoods, and in jamm’s. Jammin’ Coats will dry to a semi-gloss finish. See our Product Application Directions Booklet for instructions on how to achieve a high gloss finish. Protective/ Bonding/ & Jammin’ Cleer should never be used as an exterior final cleer. Note: X-otic Colours Cleers are tintable. A toner could be added to our Sun-Bloct Final Cleer. This will intensify the depth of colour of an underlying Basecoat or Solid Colour. For convenience, Production Cleer and Sun Bloct-Final Cleer are filled to 23 and 24 ounces respectively in a 32 oz. quart container. This allows room for the direct addition of catalyst and optional tints. Our catalyst is sold in an 8 oz container and is mixed directly into the quart can. The addition of catalyst to the 23 oz. quart of Production Cleer produces a slightly over-catalyzed product for faster curing. The addition of catalyst to the 24 oz. quart of Sun-Bloct Final Cleer maintains our 3 to 1 mixing ratio. The ability to directly add our 8 oz. catalyst container into either product’s quart container reduces common mixing errors.